I recently announced a new weekly post “Cookbook Friday” where I plan on sharing some of the gems from my groaning shelves of cookbooks each Friday as the name might suggest! Mr Slater describes himself as a cook who writes and, in my opinion, he does both impeccably. I’m only sad that his cooking shows aren’t shown on US television but it does allow me to binge-watch when I go back to the UK to visit. The Kitchen Diaries: A Year in the Kitchen with Nigel Slater is an utterly fascinating glimpse into his world – we get to walk around the garden, peek in the pantry, choose a fresh fish at the fishmongers and sit at the dining table as he eats his daily meals. This is the first of three superb volumes covering Slater’s annual cooking and eating habits and the author’s favorite book from his own backlist. Readability: From the joy of a perfectly ripe cheese to the description of a restorative soup to enjoy after holiday overindulgence, The Kitchen Diaries just demands to be read from cover-to-cover. Everyday tasks and foods transform from the mundane to the compelling in this book. There are occasional ingredients or comments that are very UK-specific but I can’t imagine they would detract from the overall book. Nigel Slater’s writing style is thoughtful yet familiar, descriptive and evocative, personal and humorous and dare I say it, sensual. Recipes: Over 300 sweet and savory recipes and meal ideas with a seasonal focus suited for the beginner to the advanced homecook. If you’re looking for a strict recipe book with precise instructions and ingredients then this isn’t the book for you. If – like me – you’re as happy as a clam in the kitchen with seasonal ingredients and the time to cook them, and you appreciate a more conversational tone of writing then I think you’ll love The Kitchen Diaries. Photography: Jonathan Lovekin. Need I say more? 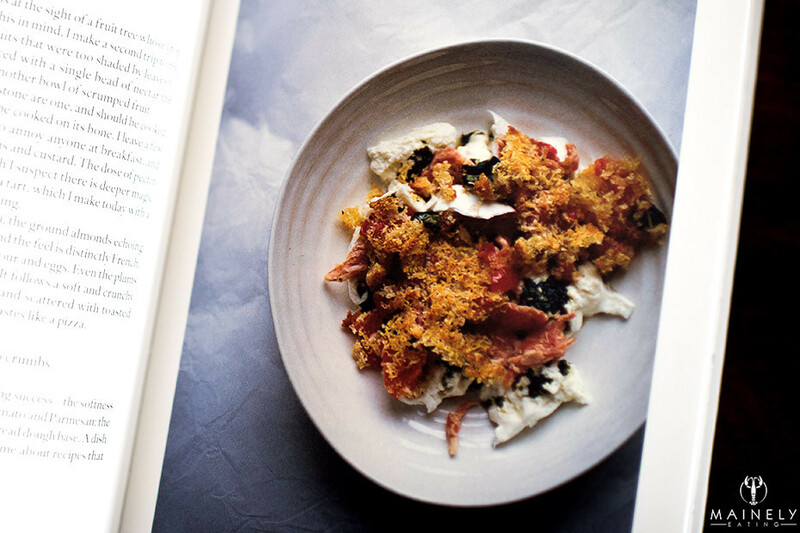 The photography in The Kitchen Diaries (as in most of Nigel Slater’s books) is sublime. There’s no complicated styling or props and it’s very clear that this is (real) food, cooked and quickly photographed (perfectly I might add) and then eaten. This is a book I read over and over and over again. I just read through “February” again and I’m already planning to make slow-roasted lamb shanks the next time I see them at the butchers. And to celebrate the launch of this new weekly series, it’s a COOKBOOK GIVEAWAY!!!! 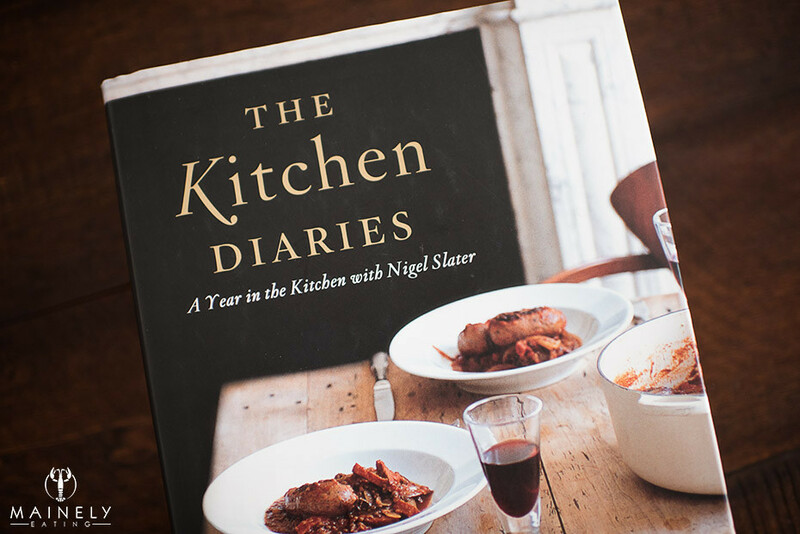 One lucky winner will receive a copy of The Kitchen Diaries by Nigel Slater. 1. Leave a comment on this post and let me know what your favorite cookbook is. 2. Follow @Mainely Eating on Instagram AND post a picture tagged #cookbookfriday it could be a picture of your own cookbook shelves, your favorite cookbook, or a selfie reading the book! I’ll randomly pick one winner at noon (EST) on Monday February 8th and a copy of The Kitchen Diaries will be on the way as soon as I have an address. And if you don’t win, you can click on this little (affliate) link to get your own copy! If you’re wondering why the cover looks different, it’s because I bought my copy in the UK. Official rules: No purchase necessary to enter or win. Sweepstakes open only to legal residents of the 50 states of the USA (and the District of Columbia) who are physically located and residing therein and who are 18 years of age or older at the time of entry. Mainely Eating assumes no responsibility for prizes lost in transit. Up to two entries per person are allowed through commenting on this blog post or by following @MainelyEating on Instagram and posting a picture with the #cookbookfriday tag. This entry was posted in Cookbook Friday, Cookbook reviews and tagged #cookbookfriday, Cookbook Friday, Cookbook reviews, Review of The Kitchen Diaries, The Kitchen Diaries by Nigel Slater by Mainely Eating. Bookmark the permalink. Gah, where to start? I always come back to Marcella Hazan’s Essentials of Classic Italian. I’ll have to checkout Nigel Slater! I LOVE Ina Garten’s cookbooks. Most recently, I have been enjoying Make It Ahead (try the Roast Chicken with Bread and Arugula Salad and the Winter Slaw). 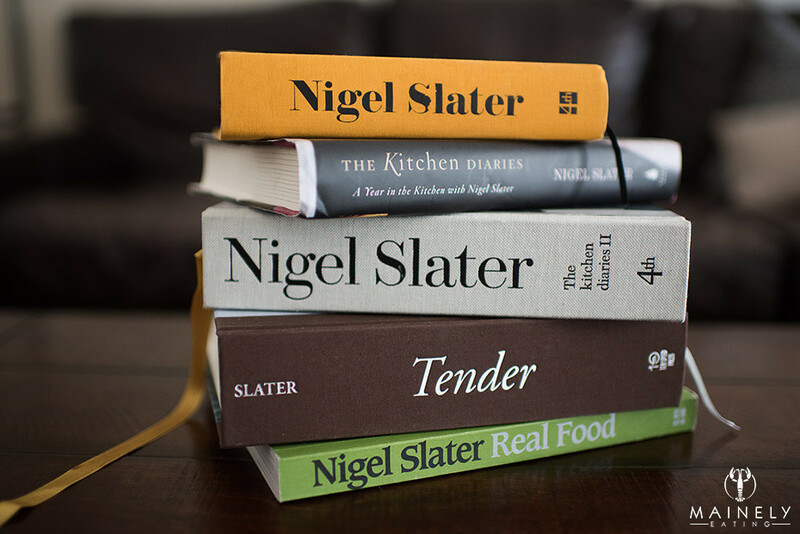 Fun to read your review of Nigel Slater!